Picot bind off is a very nice knitting method to add some girlish flair to an edge. This method will create small points on an edge that look sweet and cute. It is great for baby socks, drawstring bags, skirts, wrist warmers, blankets and a variety of lace knitting projects. I love picot edging, especially the ruffled edge with picots. The picot bind off can be varied depending on the size and how far apart you want the picots to be. The picot can be made with just one stitch if you want a subtle look or it can be made with more stitches if you want it to be impressive. Of course, the size of picots may vary depending on the type of yarn you are using. step 1 : Knit two stitches and make a normal bind off one stitch. step 2 : Transfer the single stitch on the right needle onto the left needle. Knitted cast on two stitches. step 3 : Normal bind off four stitches. Repeat step 2 to step 3 until you are out of stitches to bind off. Photo no. 1 shown is what your stitches look like after you have made the two stitches knitted cast on. Photo no.2 shown is a picot that created on an edge after you have made a normal bind off 4 stitches. This method is requires a bit of extra yarn and it may take a bit more time than a normal/plain bind off. If you want to make a bigger picot, cast on more stitches. 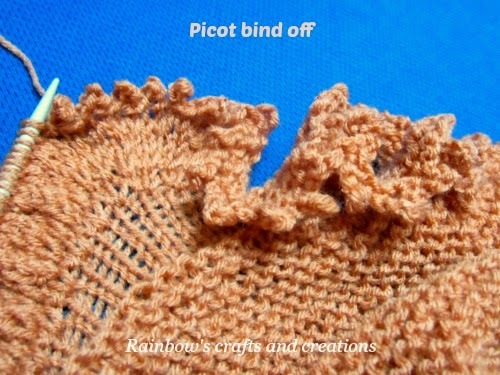 The picots can be spaced further apart by binding off more stitches after you have bound off the cast on stitches.